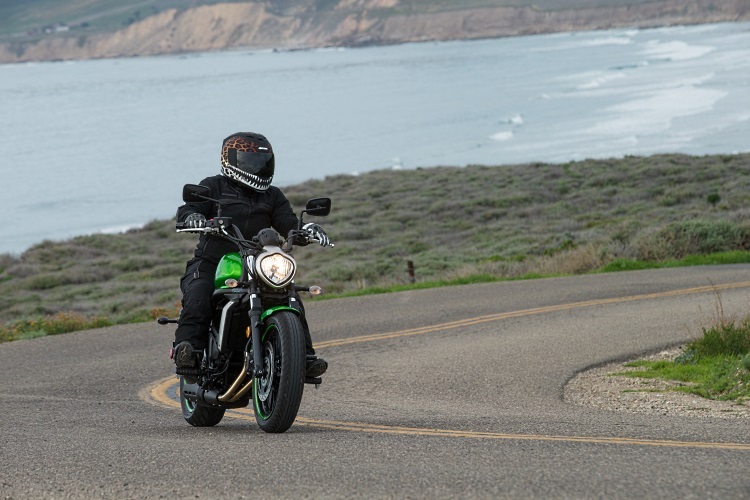 Test Ride: The 2015 Kawasaki Vulcan S | welcome to the janniverse. Being a short rider presents a special set of challenges. You know going in that your feet may not reach the ground, but short people usually also have short arms and torsos as well, so the reach on that particular bike you’ve been ogling might not work out, either. And that’s not even touching on the matter of foot controls, and whether your legs are long enough to comfortably operate them—particularly on longer rides. That, my friends, is a problem that Kawasaki is hoping to solve with its new Vulcan S model. The engine is a differently-tuned version of the liquid-cooled 650 parallel twin that’s currently found in the Ninja 650. A 27.8” seat height is nothing new for a cruiser, but there’s one thing Kawasaki is doing that no one else currently is: Kawi is offering its Ergo-Fit components to buyers directly in the showroom, at no additional charge. Other motorcycle manufacturers offer a wide range of factory options that you can have fitted to the bike that won’t void the warranty (if you’re into that sort of thing), including some reduced or extended reach bars, footpeg adjusters, and seats. Kawasaki sets themselves apart by letting you try different configurations in dealer showrooms, at which point you can then pick out the Vulcan S Ergo-Fit configuration that best suits you—without shelling out extra to make it fit you comfortably. With 2 handlebar options, 3 seat options, and 3 adjustable footpeg positions, the Vulcan S should comfortably fit a fairly wide range of riders. That’s great news for a short rider like me, and also for some of the really tall riders I know. Also, and perhaps more importantly—that leaves you with more money to spend on fun accessories after you walk out of that showroom. Before spending 130 miles of seat time with the Vulcan S, I sat on the reduced reach, mid reach, and extended reach configurations. As a 5’3” rider, I have to tell you that not only was the extended reach configuration hilarious—it was also the most like the feel I’ve gotten on many other cruisers that I’ve attempted to ride. You wouldn’t think an inch or two would make such a huge difference (we’re talking reach here, guys), but just like adjusting the driver’s seat in your car, you’ll see that it does. Another great feature of the Vulcan S is the exhaust routing—straight back and underslung. Kawasaki says this allows for more aggressive cornering, which is true. What’s even better about this is how much easier it makes your life if you’re a shorter rider. Tall guys and girls won’t care, but us shorties get hot thighs on high side-routed exhaust pipes. Sure, we’ll put up with them in the name of riding, but we’d rather not. Points scored, Kawasaki. Points scored. The bike itself is surprisingly light in feel. It’s one thing to see numbers that tell you that it weighs less than 500 pounds, but it’s another thing to feel how that weight is distributed. It’s as light and agile a feel as you’re going to get out of a cruiser, and I’m happy to say that it isn’t just PR-speak saying that Kawasaki clearly brought some of its sporting heritage to the design of this bike. While you’d still have to tweak it quite a bit to take it racing, it’s a nimble little street machine with great pull through the rev range. There’s some slight stuttering if you’re going very slow (like 20-30mph) down in first and second when you initially start riding it, but like any bike, you can finesse it more and learn where the sweet spots are as you get to know it. The lay-down rear Kayaba shock helps maintain that long, low, lean cruiser profile, but does an admirable job of soaking up bumps on uneven roads and at railroad crossings, even after a day of steady riding. The material cushions and also holds you in place, so you don’t slide unless you want to slide when you’re shifting your weight to go around corners. Stylistically, I love the shape of the headlight. Somewhat resembling a strawberry, it looks modern and stylish and sets it apart from other bikes on the road—even if you don’t order your Vulcan S in Kawi Green. The clear turn signals (front and rear) are also quite nice, as are the black mirrors. I’m not very fond of the cylinder head finish that’s meant to resemble cooling fins, because that’s just silly on a liquid-cooled bike. Other than that, the finish and the visuals are pretty solid, and deliver a sound bit of modern, urban cruiser style for an MSRP of $6,999 for the regular Vulcan S or $7,399 for the Vulcan S ABS. It launched in February 2015, and is now available in your choice of Flat Ebony, Candy Lime Green, or Pearl Crystal White.